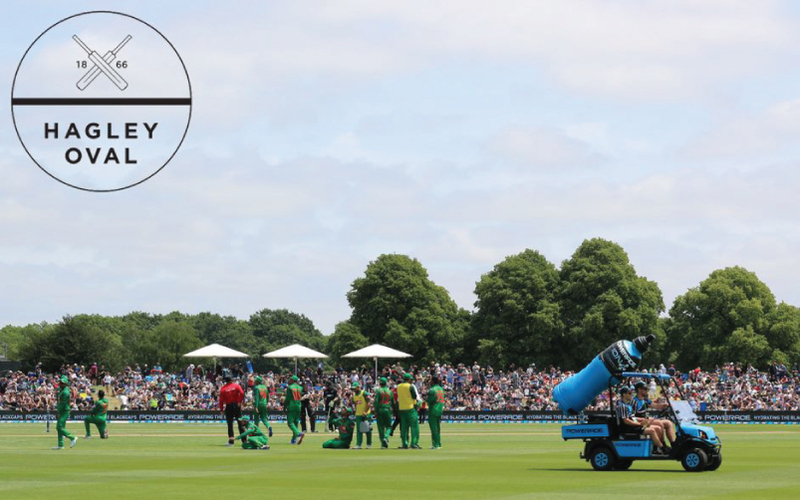 Popular summer venue Cornwall Park Café have invested in a New Zealand cantilever umbrella from Auckland based company Shade7. 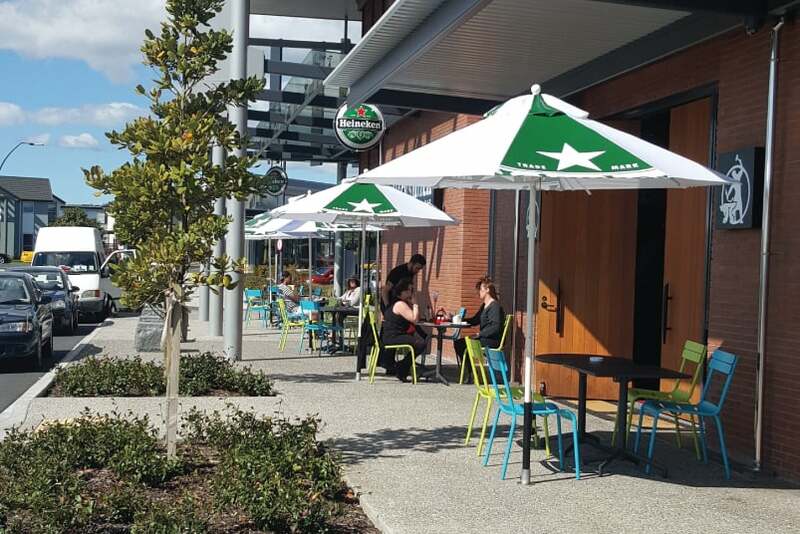 The bustling cafe required high quality outdoor cantilever umbrellas to increase their shade coverage in their busy outdoor courtyard. Shade7 continues to make waves with their outdoor umbrellas reaching various parts of the world. 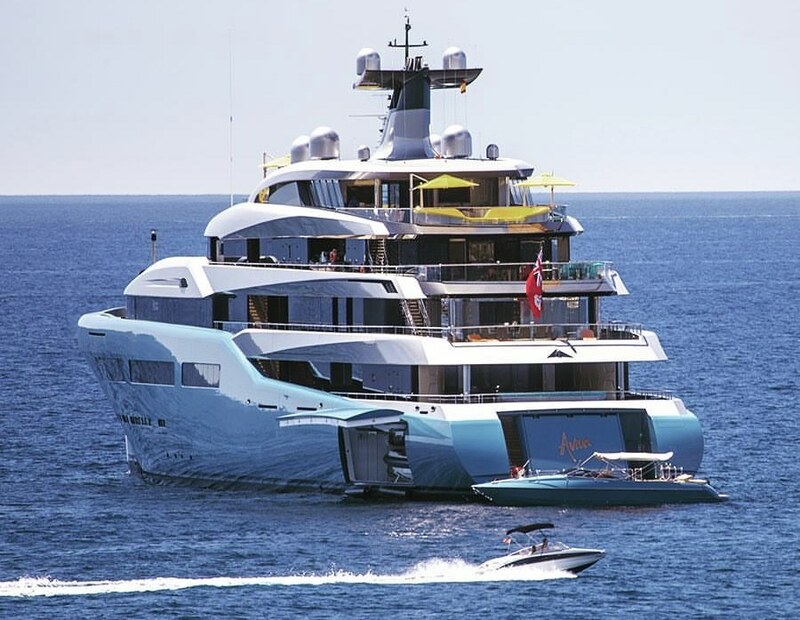 The latest vessel to install some of Shade7’s cantilever umbrellas is the giant motor yacht known as Cocoa Bean. 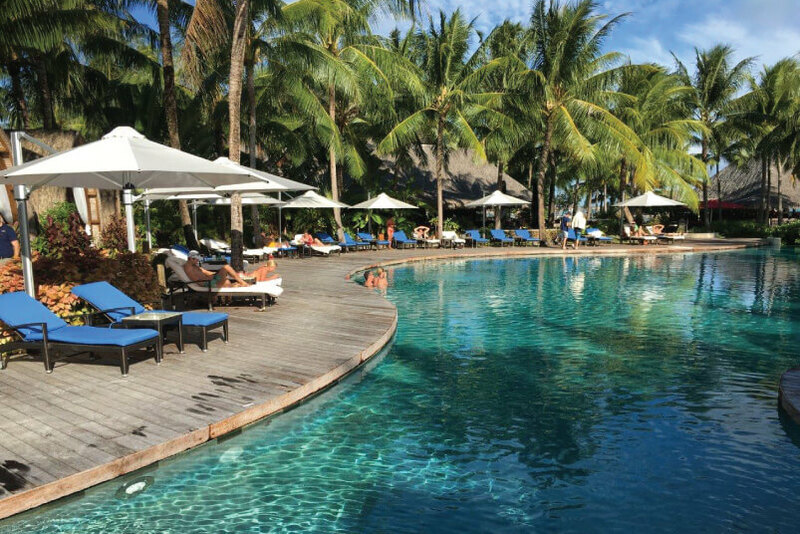 Shade7 continue to export their outdoor sun umbrellas to tropical destinations such as the stunning Cook Islands. 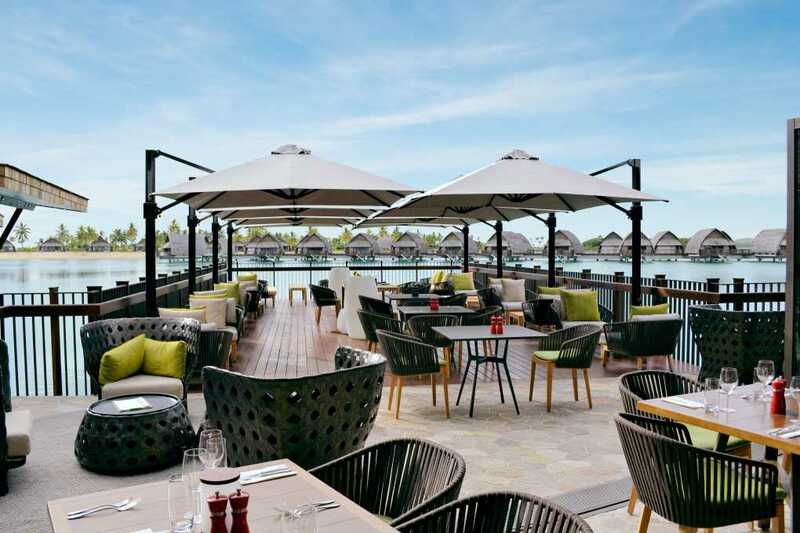 Newly opened Moana Sands Lagoon Resort have launched with the investment of some quality Shade7 outdoor sun umbrellas. 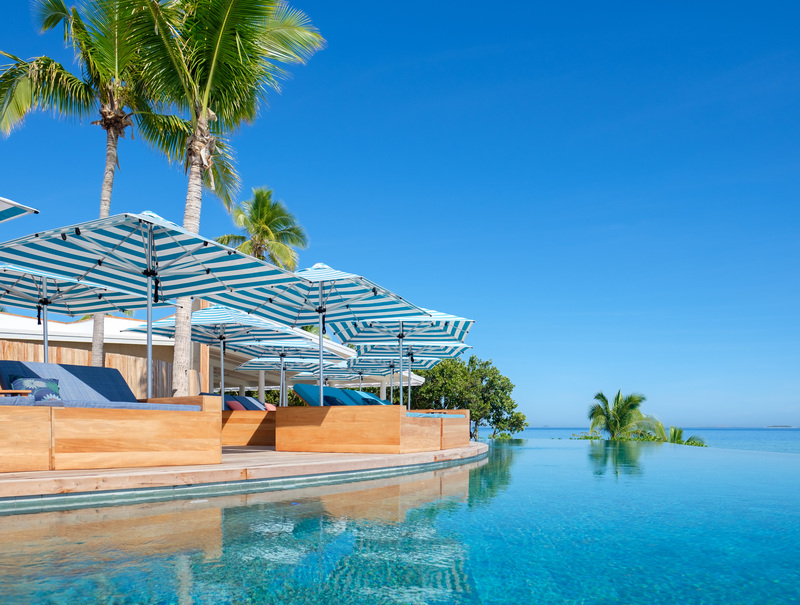 Shade7 are proud to have been involved in the fit-out of yet another new resort in Fiji, supplying a large number of sun umbrellas to Six Senses Fiji. 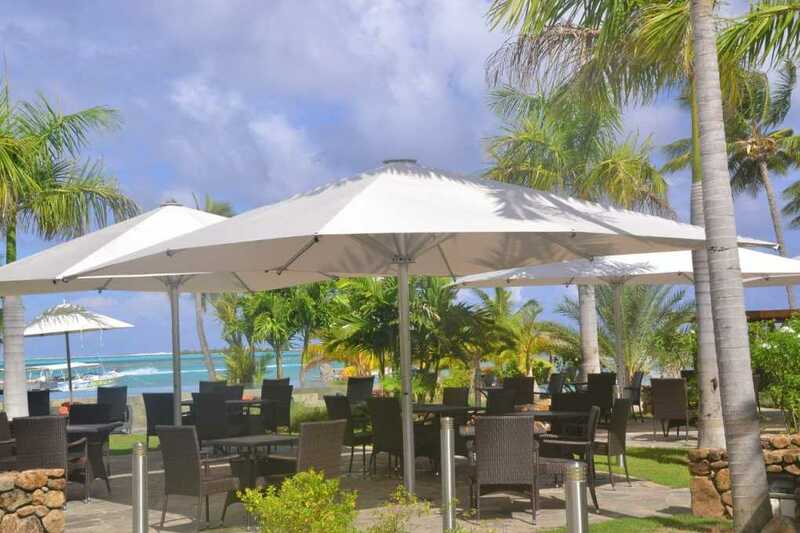 A mixture of Shade7’s centre post umbrellas and cantilever umbrellas have just been installed to offer shade for the guests at this brand new resort. 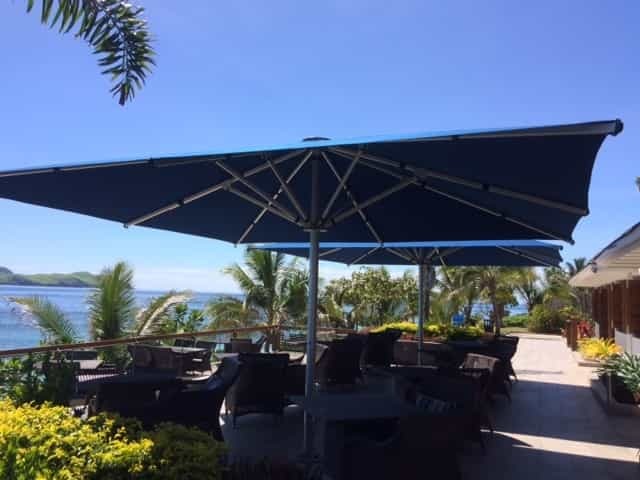 Shangri-La Fijian Resort have once again called upon Shade7 to provide some shade for their guests at Fiji’s largest resort, with the installation of several Riviera cantilever umbrellas. 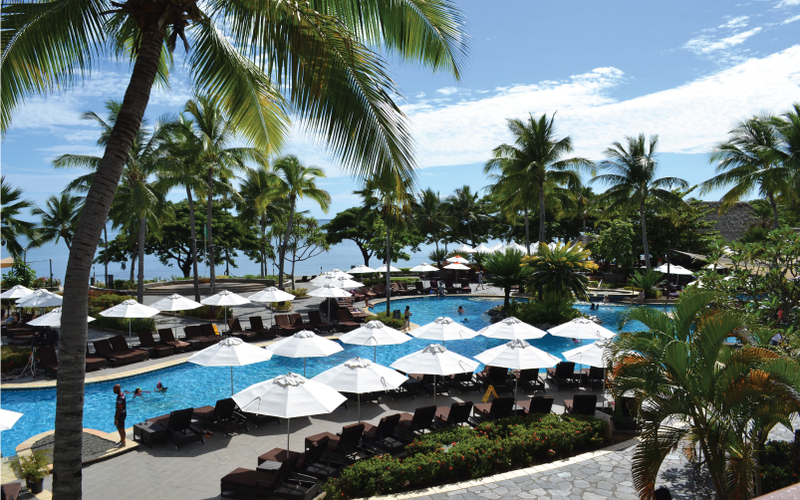 The Sheraton hotel brand have three beautiful resorts situated in Fiji, two in Denarau and one on Tokoriki island. 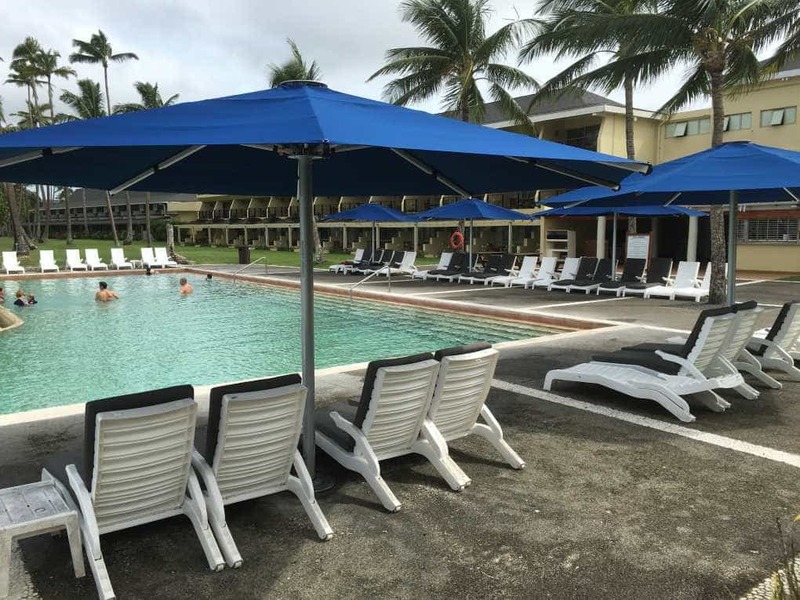 One of their most recent Shade7 New Zealand outdoor umbrella upgrades has been at the Sheraton Denarau Villas, located on Denarau Island off Nadi. 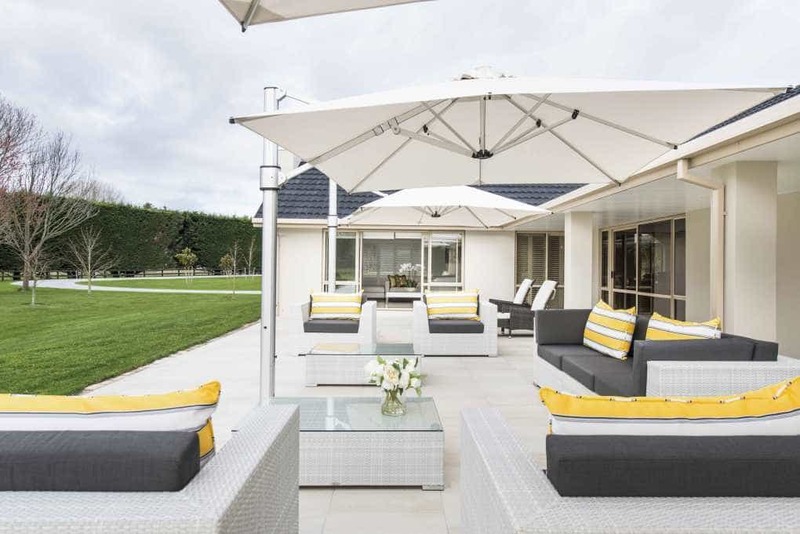 New Zealand company Shade7 have gained a strong reputation for providing high quality outdoor umbrellas to residential homes and commercial customers. Some of the more unique projects however have involved supplying their outdoor umbrellas to superyachts. 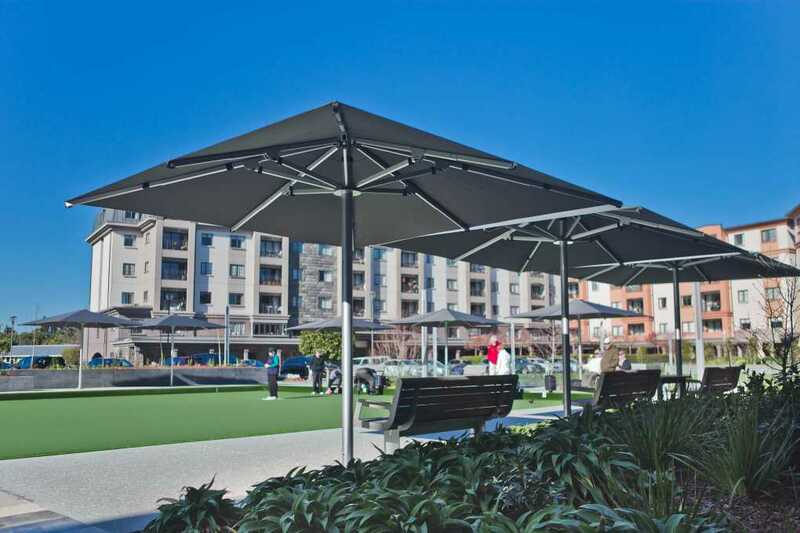 New Zealand based company Shade7 continue to see their outdoor umbrellas featured on various projects all over the world. Their own designed and engineered Riviera cantilever umbrellas will literally set sail across the world on a brand new superyacht boasting its own state of the art innovation. 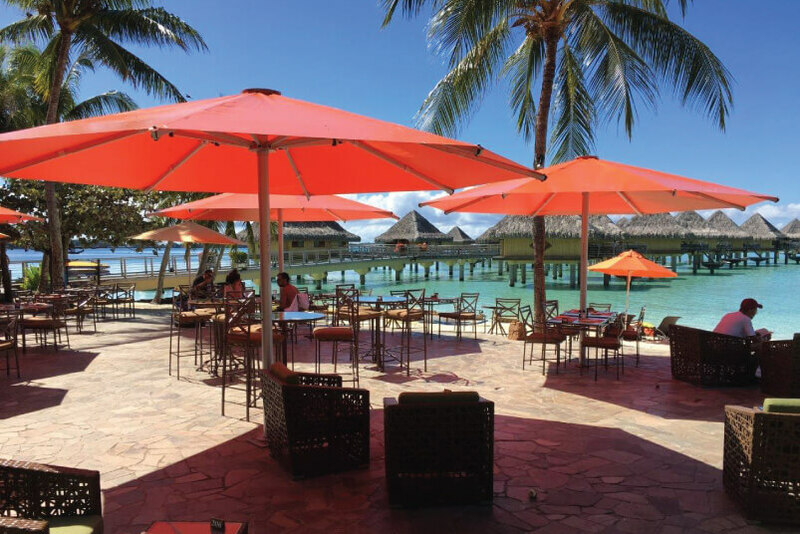 Shade7 continue to solidify their presence in the South Pacific, with the addition of their giant Tempest commercial umbrellas installed throughout the beautiful InterContinental Bora Bora Le Moana in French Polynesia. Providing shade along coastal environments require solutions to meet both aesthetic appeal and strength. 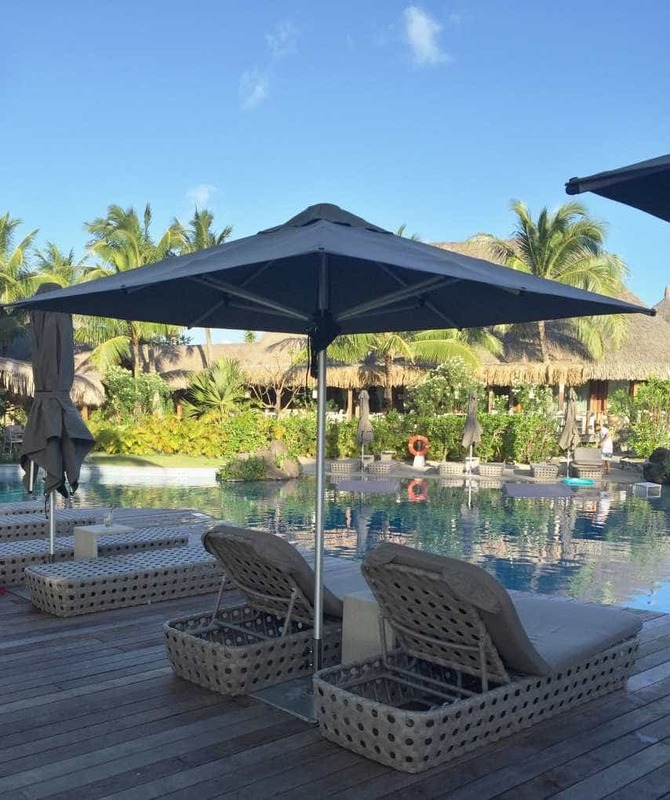 Shade7 have provided both for Four Seasons Bora Bora with the supply of their super strong Fibreglass outdoor umbrella in a special wood-grain anodised aluminium finish. 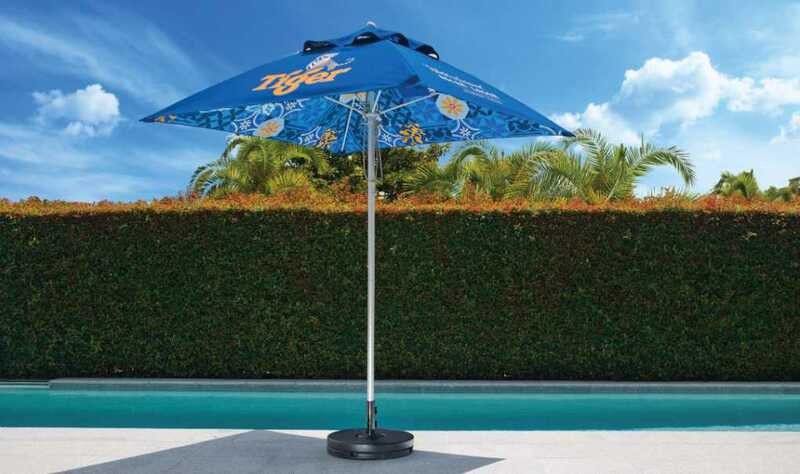 Shade7 strive to develop fresh new innovative outdoor commercial umbrella designs which seem only fitting to be featured in some of newest resorts around the world. 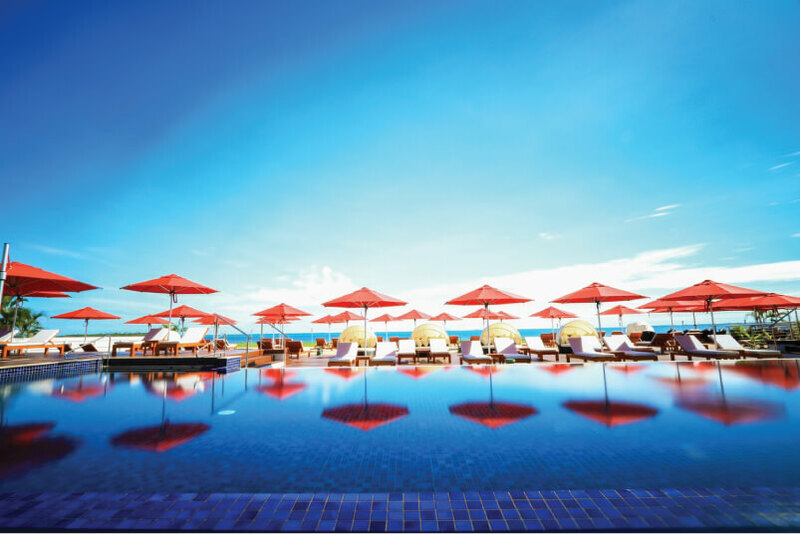 The Hilton KORO is a brand new adults only resort complex featuring Shade7's stunning Riviera cantilever umbrellas, Monaco centre post umbrellas and Tempest commercial umbrellas. 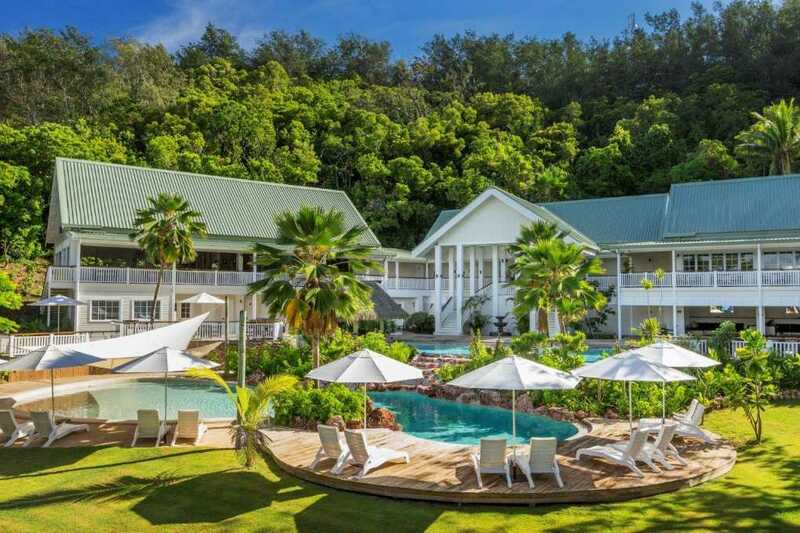 Fiji's newest five star resort Fiji Marriott Resort Momi Bay has gone to every effort to create an unforgettable resort experience for guests. 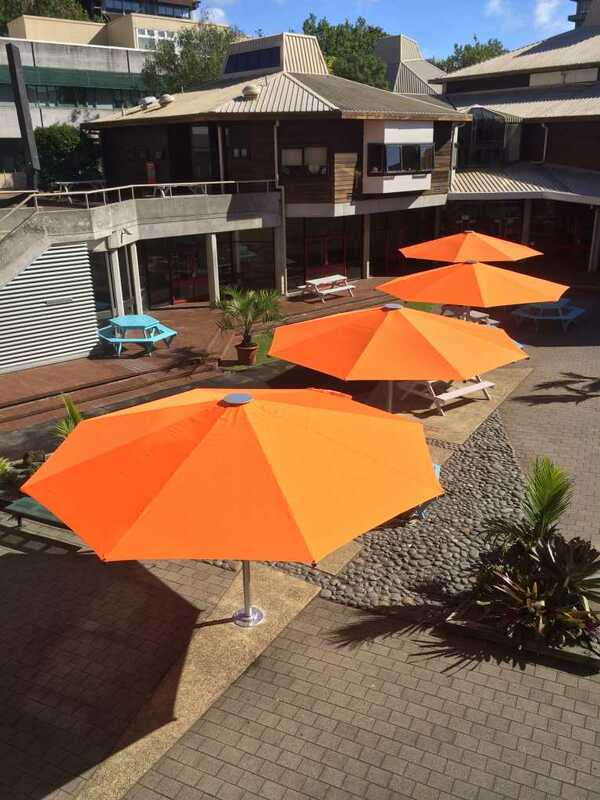 To assist with creating the right atmosphere and facilities, Shade7 in New Zealand were called on to provide some stunning state of the art outdoor centre post and cantilever umbrellas. 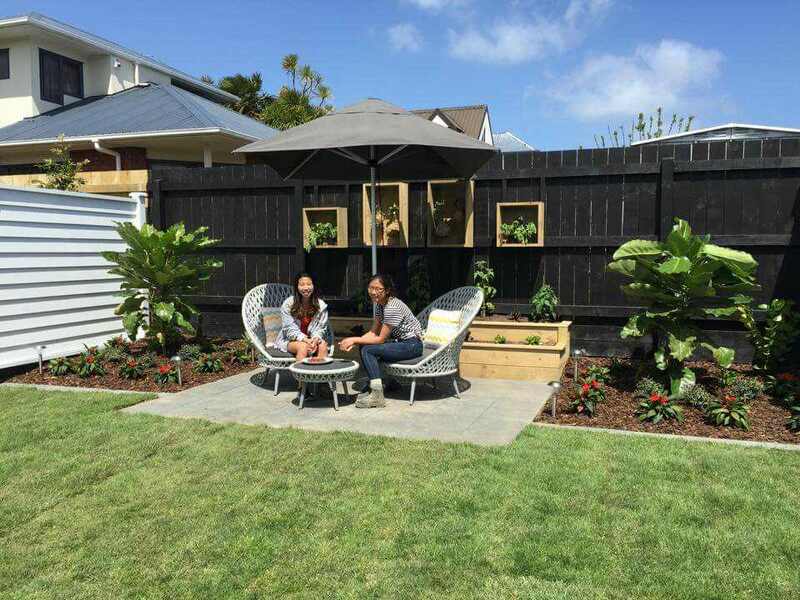 Internationally recognised tertiary educator The University of Auckland have recently work with Shade7 as they continue to maintain a place of excellence for their students. 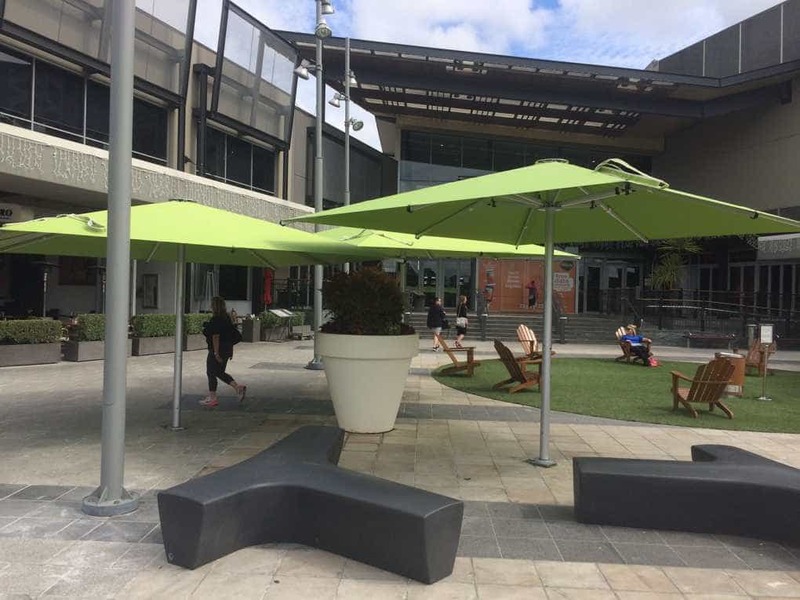 Award winning shopping centre Westfield Albany have recently given their main mall entrance a face lift with the addition of some large, bright and summery outdoor commercial umbrellas from Shade7. 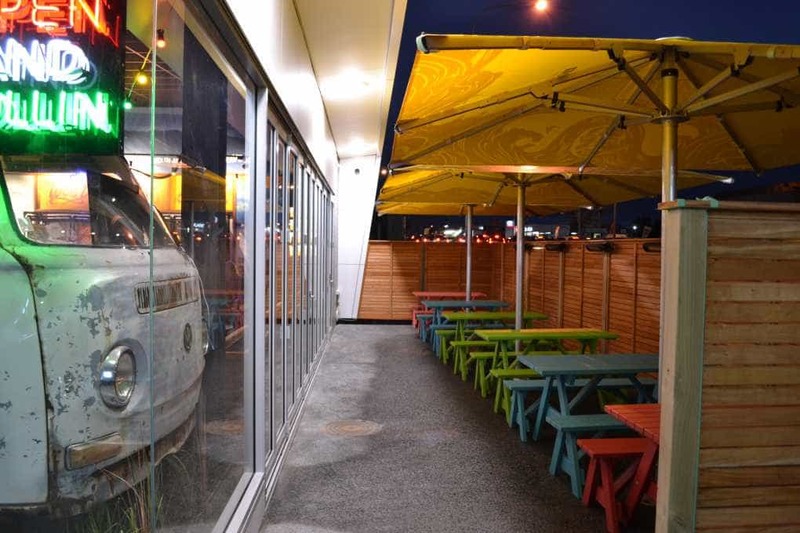 Nationwide fast food restaurant Mexicali Fresh have added another location to their group with the opening of their Henderson store in Auckland. Shade7 had the opportunity to provide custom printed outdoor umbrellas for their new outdoor area. 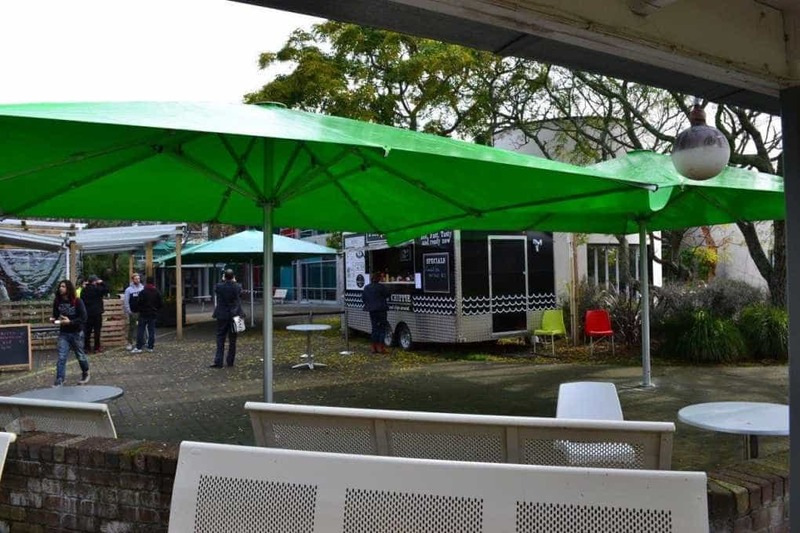 Unitec, New Zealand's biggest technology institute, have called on Auckland company Shade7 to supply large outdoor umbrellas to create an outdoor environment for students to enjoy during the expansion of their campus. 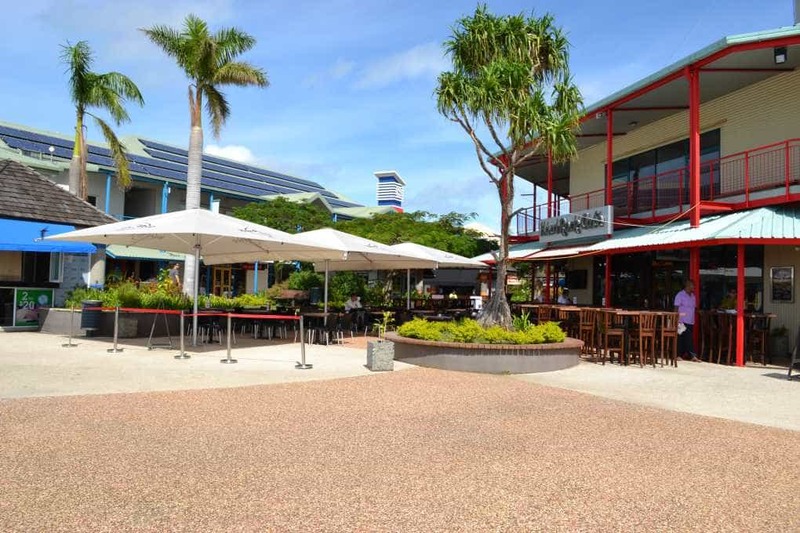 World renown brand Hard Rock Cafe Fiji have installed branded commercial outdoor umbrellas from kiwi company Shade7 as part of recent improvements to their outdoor dining area. 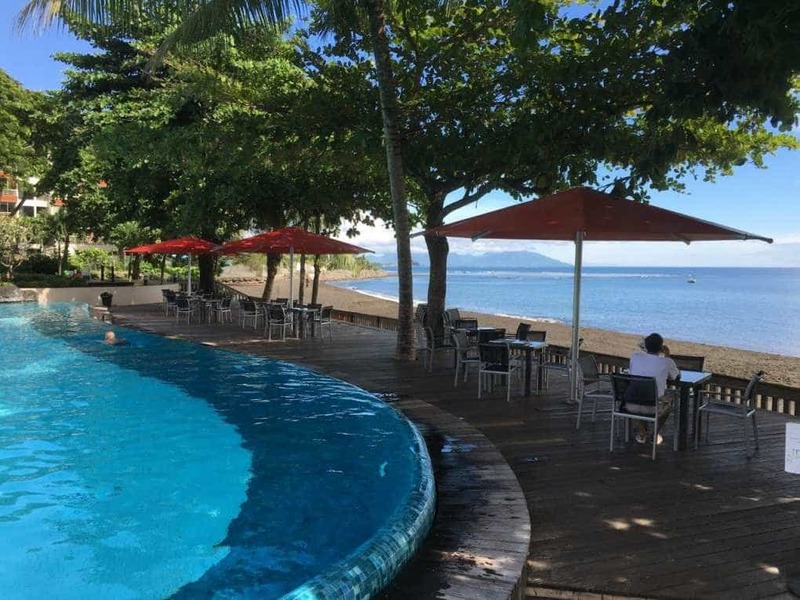 Shangri-La Fijian Resort and Spa, the largest resort in Fiji, is now home to a line-up of giant Tempest outdoor commercial umbrellas from New Zealand based company Shade7. 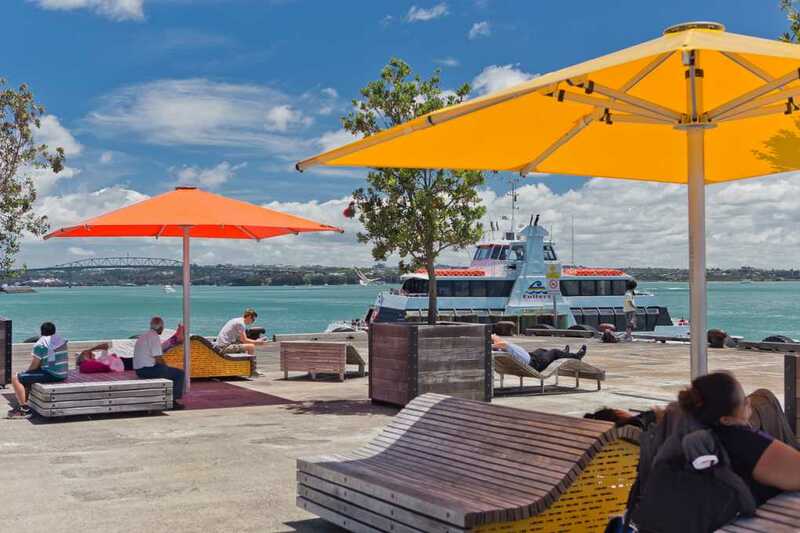 Auckland CBD's popular public waterfront space, Queens Wharf, have been making some bold and exciting new changes to this popular harbour side spot. Mention the word Fiji and it can conjure up images of a tropical paradise with glorious sunshine, golden sandy beaches and coconut trees. It is a popular Pacific Island holiday destination for tourists worldwide. 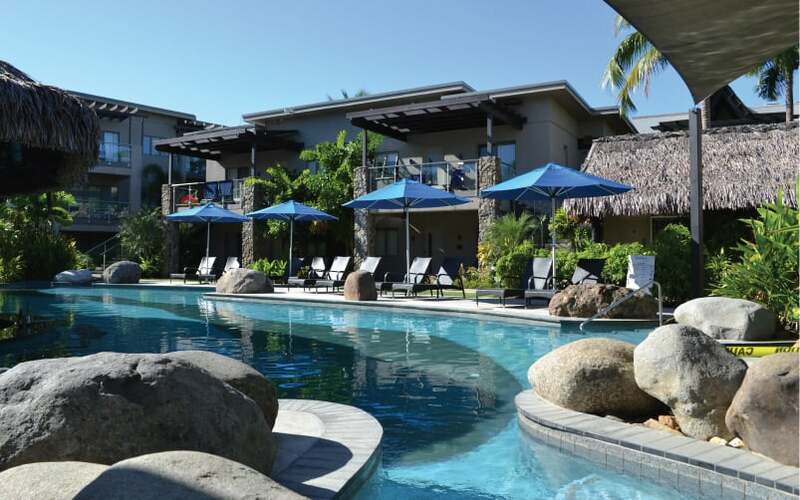 The Fijian Islands are home to a number of stunning resorts including the Malolo Island Resort which require quality sun umbrellas to offer shade for their guests. 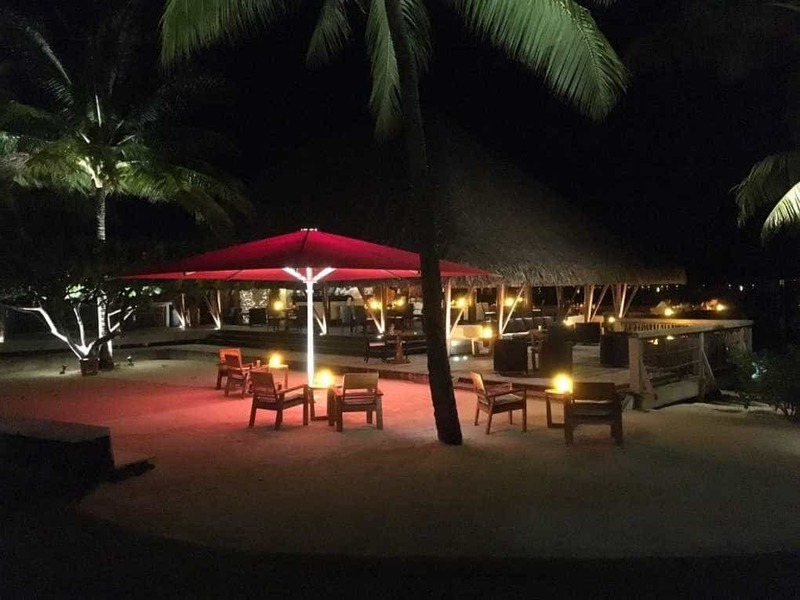 Intercontinental Moorea Resort and Spa in French Polynesia have recently finished developing a new outdoor dining area within their luxurious 27 acre property. This has included the addition of Shade7's Tempest commercial umbrellas. 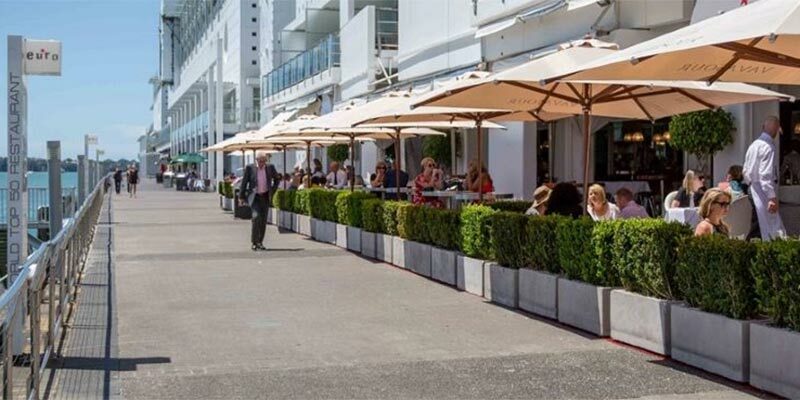 Euro Bar and Restaurant, a bustling eatery located in Auckland’s Princes Wharf, have recently expanded their outdoor dining area which includes the addition of a series of branded Alfresco Market Outdoor Umbrellas.